Arizona is experiencing a really, really early spring. Today it is 87 degrees and the weather is beautiful. February was the second warmest on record for the state. March looks as if it will be the same. The pond lillies are starting to grow new leaves. The Iris are getting ready to bloom…and there is plenty of string algae. I have found the best way to get rid of most of it is simply to pick it out manually. 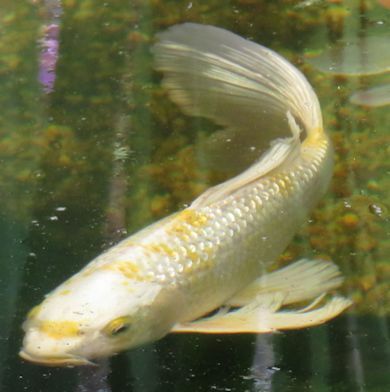 I have also started using peroxide and and Koi Clay once a week to get rid of the string algae I cannot get. You can get a quart of peroxide at WalMart for 88 cents. I get six at a time and dump all six quarts into the pond. It doesn’t hurt the fish. be good for them by replenshing minerals, enhancing their immune systems and their coloring. I just started so time will tell. I am also using — of all things — kitty litter with no perfumes or dyes. WalMart has a 25 lb. bag for $4. The really cheap kitty litters are pure bentonite clay. It acts as a flocculent, binding with debris which then settles on the bottom. I’m trying to use only natural remedies because they don’t harm the fish and I learned my lesson about adding chemicals to the pond. with 20 inch lengths. Put together about 24 of them, fold them over the bottle and secure with a plastic zip tie. 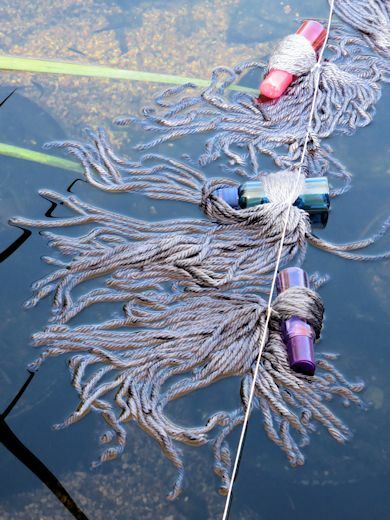 I made 4 of them, attached string to them (so that I can retrieve them easily) and strung them across the pond. I also obtained a square, breeding net. 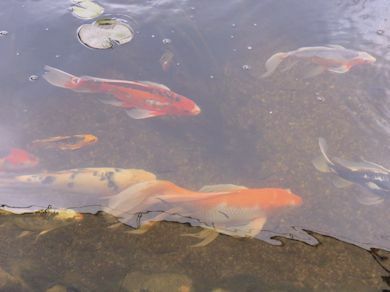 If I have any success I will put the Koi eggs in the breeding net that will be anchored to the side of the pond. It’s just another experiment. We’ll see if it works. I will be doing a water change this weekend. 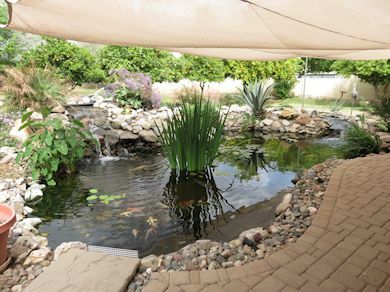 We will drain about a third of the pond water and replace it. I plan to spend the next few weeks cleaning up plant debris from the landscaping around the pond. Believe it or not we did have a few nights of frost. I got lazy this year and did not cover up the plants. I will pay for it by trimming dead foliage. Once that work is done bring on the summer. The pond is ready.